I did it just about identical, except I added a little glue around the back of the hat to glue it to the snowman's head. And I used different things for buttons and hat ornament, but I really like it! If I hadn't been in a hurry to make one, I would not have bought the sequins. I think I would have scrounged in my button box and beads for them. 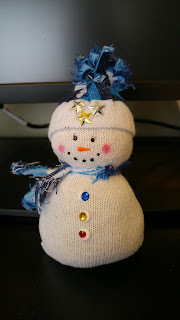 The sequins were the most expensive things, but there are enough sequins to made an army of snowmen. Remember, 3 pair of socks make 6 snowmen. I found the socks and blush at the dollar store. The rest I got at Wal Mart.